All Things Cahill - The online home for Mark Cahill, and indeed, all things Cahill! 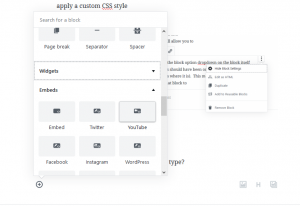 Wow, just when I’d thought the way forward in online web publishing was to get rid of “blocks” WordPress brings them back. Not utterly thrilled with that, on first glance, but hey, at least we now we’ve got a better representation of what the content will truly look like when published, before we hit the publish button. 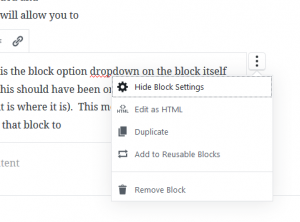 Another interesting feature is the block option dropdown on the block itself (the jury is out on whether this should have been on the right margin block menu in my mind, but hey, it is where it is). This menu gives you neat things like the ability to duplicate a block, add to “Reusable Blocks” and “Remove Block”. So how about adding a different block type? Now you’ll have a menu full of different predefined blocks. Embeds like Vimeo, Soundcloud, Meetup, etc., widgets for whatever widgetized plugins you’ve got, formatting, layout, as well as any custom blocks you’ve stored. A word of advice. Working with images, I like to float text next to an image. It took me a little while to figure out the process here. From previous block, hit enter. To the right side of the new block click the image icon and import. 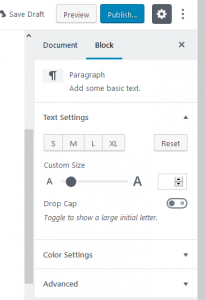 Choose a size, like medium in the block properties menu on the right side margin. Choose your alignment (right) at the top of the image block. Now click the image block and two blue dots will appear. You will now be in the paragraph block to the left. I’ve been saying for a decade that WordPress was not a blogging system, it is a content management system. This change brings a whole lot more functionality to the product and makes it a much more professional system. It is more complex, but they have done a good (but not great) job of providing an easy path for less skilled users to follow to get up to speed. The thing Gutenberg does very well is it provides developers a way to more easily work with the system to develop cool functionality. 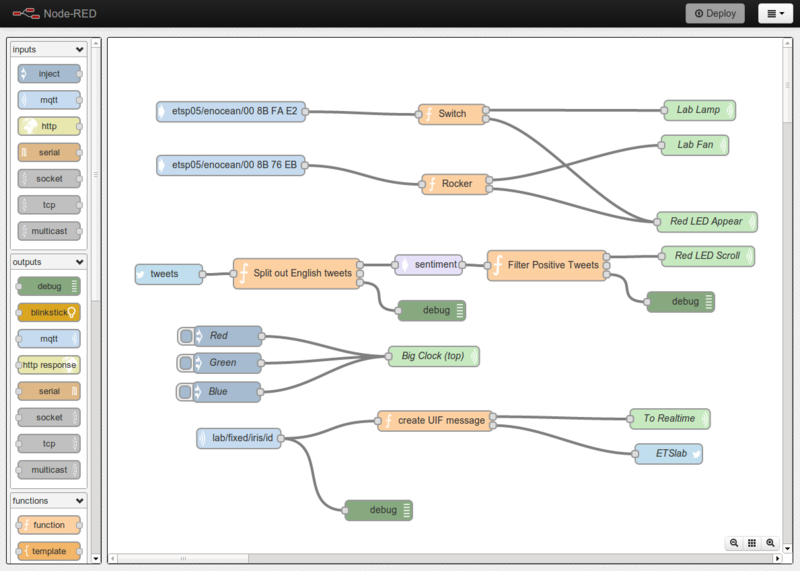 It seems much more straight forward, and I’m excited to develop some new functionality to see how it really works. For now, there’s still a lot to learn. 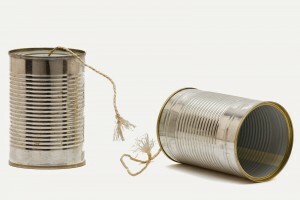 I just added a post about maintenance plans for small business websites on my business site, CahillDigital.com. If you own a site, you definitely need to read this one. Let me say this clearly: your website is often the first place customers go before they call you. What do you think they do when they see a broken website? Update software and plugins regularly. If not monthly, certainly quarterly. Keep your information up to date – do a monthly check that your info is correct. Check that all means of contact through your website work – check all forms are properly submitting, emails are being received, etc. Know when your domain expires and be sure it renews well ahead of time. One of the things I love about my job is getting to know small business owners and finding out how their businesses work. It never ceases to amaze me the interesting niches so many of you have found and the interesting clienteles you serve. When I started in business there were tons of businesses named “AAA Construction”, or “AAAA Window Treatment”. Business owners did this because they wanted to be sure they came up first in the Yellowpages. The difference between first position and 8th position on the page could be THE difference in their business. Today we have a similar problem. 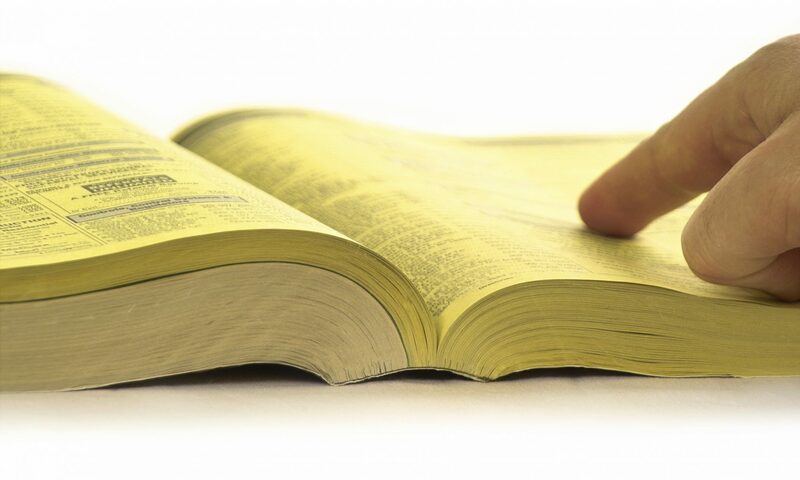 While customers don’t actually pick up the yellow pages anymore, they do go to Google, and in a lot of ways they use it exactly like they used to use the Yellow Pages. Think about it, how would you find a septic pumping service? You’d probably go to Google and type “septic pumping”. Google might help you out with a few local results, but I think most of us would then go to a better search “septic pumping Sutton Massachusetts” in my case. That is most likely going to give me a list of people who do septic pumping in Sutton. An interesting thing happens though. 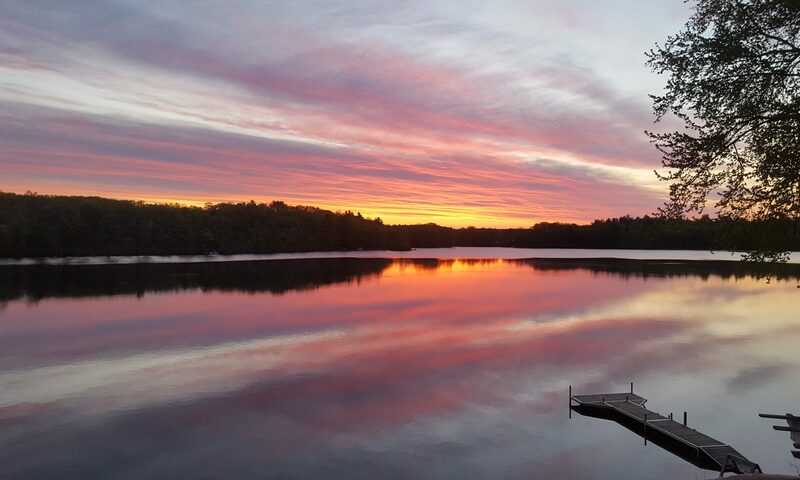 While Chase/Harris Septic is located in Sutton, the first company with a search result is Wayland Septic. Wayland is about 45 miles from here. Why is that? 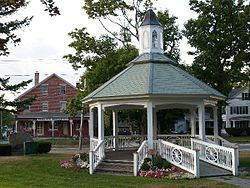 Because Wayland Septic has spent the time to optimize for the keywords “Septic pumping Sutton MA” via this page. The local company is showing up #7 on that search page. Does that affect their business? Do you think Wayland Septic is getting more business due to their search position? Dog Grooming Worcester, MA – See Dog DayzGrooming is either 1 or 2 in the actual organic listings (there may be a directory site or two above). Buy Carnival Glass – this is a tough worldwide market with thousands of competitive sites – but CarnivalGlass.com comes in at #2. right after EBay. Now think about what other terms your customers might be using to try to find you, and instead may be finding your competitors. Are you missing out? If you own a small business, and haven’t optimized your site for local search, you’re missing out on business. Contact me and I can get your phone ringing with new business. Together with Steve Salloway of Davis Advertising, I launched Virtual Ad Club today. The site is an online community for advertising professionals, inspired by the old meatspace group, the Worcester Advertising Club. The site will cover general advertising, account services, martech and media ends of the business, as well anything else that generally fits under the general category of advertising. The site is a WordPress backend, with BBPress forums attached. This is the first time in a while I’ve worked with BBPress and I must say it has come a long way. I’m not certain it’s everything vBulletin was, but I think in this case it’s going to fit the bill nicely. 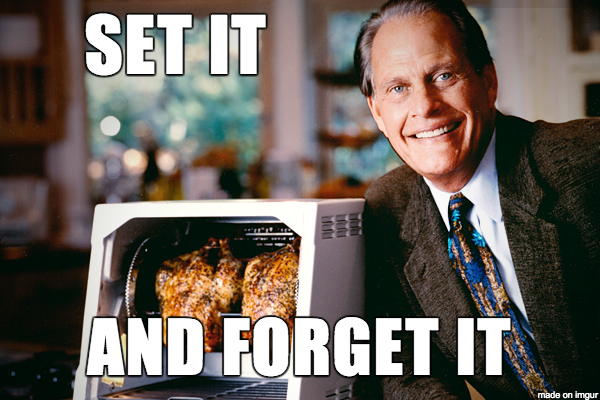 As a bonus, I’ll be writing the occasional bit on martech, which I’m really looking forward to. 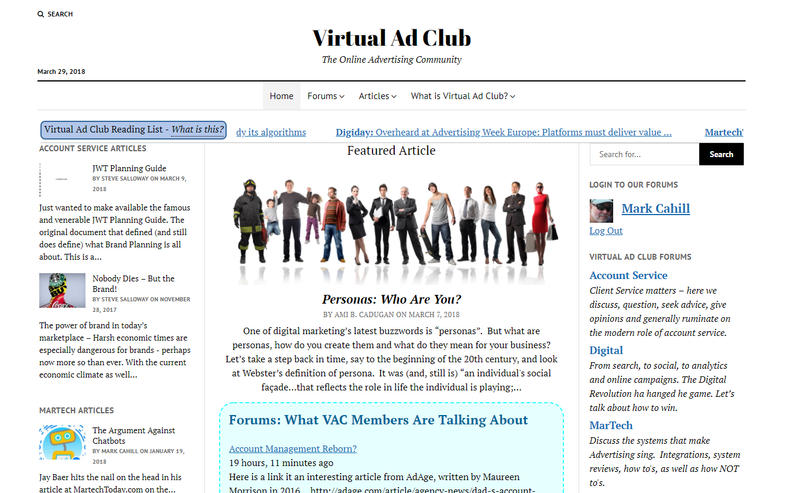 If you’re an advertising professional, Virtual Ad Club is the place for you! Google, the gift that keeps on giving. Like that kid that reminds the teacher she didn’t assign any homework before the long weekend, Google again costs website owners money and wastes their time. So now site owners like me need to migrate a WordPress site from http to https. What are we to do? Google announced some time ago that their Chrome browser would start marking all sites that do not use the https protocol. as insecure this July. Further, SearchLand has been reporting that for sometime Google’s top search results have returned more than 50% https sites. In other words, their algorithm is favoring HTTPS sites. For site owners, this means they’ll likely need to buy SSL certificates, install them, and convert, then debug, their sites to get the coveted padlock showing in the Chrome browser. In a word, this really stinks for owners of large, non-ssl sites. Like me. You see, back in the day, we said SSL was only required if you were doing ecommerce and we built our sites accordingly. Hence we’ve got massive sites like Reel-Time.com that have gig upon gig of content laden with possibly externally linked images, that won’t pass for HTTPS. So how do you migrate a WordPress site from http to https? I should note here, the problem is external images, not adding the cert. Ignore it and let Google make an example of you. 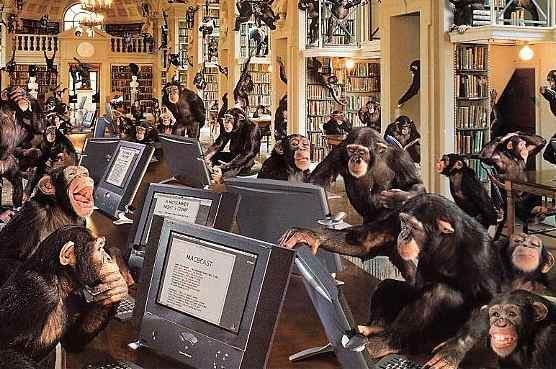 Hire an outsourced team of monkeys to manually find download and replace the images and hope they don’t screw up. Hire a real engineer to do the migration programmatically. I was able this morning to update AllThingsCahill.com to use the new protocol, and was able to get a script to move the images and rewrite the links in my wordpress setup. That’s a big thing, as the site had over a thousand posts, with a similar number of images that had been linked from around the web. As you’ll see, I’ve now got the padlock showing next to the URL in the browser. 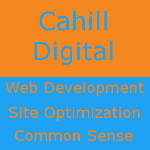 Then I did the same thing for CahillDigital.com and this afternoon I’ve got two more sites on tap. 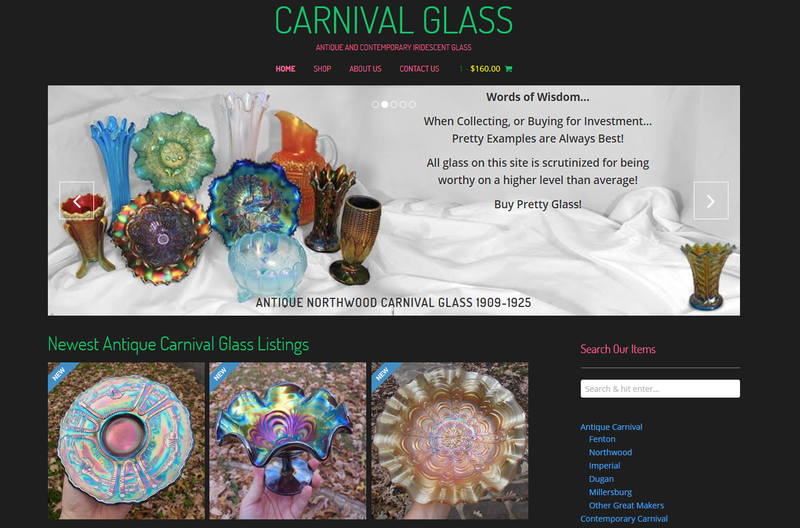 I haven’t been doing a lot of freelance over the past couple years, but I have just finished a great site called CarnivalGlass.com – a WordPress site with Woocommerce Paypal Adaptive integration. The site is built on WordPress, using the venerable Woocommerce ecommerce engine for shopping cart. The site functions as a marketplace, so payments are setup to go directly to different owners, using a neat Woocommerce with Paypal Adaptive integration. It’s also making use of the USPS API to pull real time shipping prices. The Woocommerce Paypal Adaptive integration allows the site to take payments and provide a portion of the sale price to the site, and deposit directly into the account of whichever seller owned the piece. Basically a marketplace. with a multitude of sellers, but without the hassle of disbursing payment manually. Challenges on the project included some issues with shipping classes from the post office, basically Woocommerce was grabbing the first price it saw, instead of the preferred Priority Mail 2 Day price. Another major issue was our need to reconfigure the search function to return specific results, rather than the standard “fuzzy” results. I had the wonderful opportunity to guest lecture at Emerson College this week on the subject of “Self-publishing”. 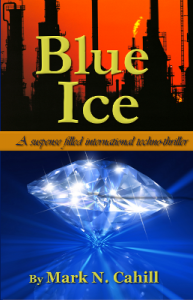 It caused a bit of retrospection, it being a full year now since I published Blue Ice. That really gets right to the core of the matter. Personally, if there were a publisher who was willing to offer an acceptable deal, I’d definitely go with them. Two words: “Marketing Budget” strike true with me. I don’t miss having to deal with an agent, having to respond to publishers, etc. and wonder if anything was going to happen. I do miss having someone who will actually handle the marketing. Someone who can run ads, etc. As a new writer, the first and most important task is to get your name and your book out there. To build readers, to find a market. Who better to do that than a marketing department. Find an editor you can work with and hang on to them. Pay them well, they’re an important team member. Hire a real professional copy editor. Find the best graphic designer you can and pay for your cover design. REALLY – books are judged by their covers, and you’re not going to get anyone to read your book if you’ve got a crappy cover. Seriously consider putting your book into the Kindle Select program – it will make it available for free reading to Kindle Prime users, and you’ll still get paid $2.99. More eyeballs is a good thing.